Kashima has been placed on rookie minding duty recently as she followed up her victory over Hina and Rina by beating Onozaki. The advantage of this is that we’re guaranteed to hear that banging theme. Unsurprisingly, this was a one-sided affair with Saki controlling most of the action and Leo getting a brief flurry in which to impress. Onozaki looked decent enough, but she lacks something. While I’m not sure what it is, I never quite buy her as a threat. I’m not sure what’s missing, but she certainly needs a few tweaks. Still, it was solid opening fare and delivered about what you’d expect — no complaints. Having Tam Nakano team up with the rookies as Goya Kong squashed them might seem like a weird spot for her, but she never actually tagged into the match with Kong. The small amount of time she spent in there was with Hana where Nakano looked a step off the pace, slipping up on a couple of moves. Not that it mattered as the focus was on putting Goya Kong over strong. She dealt with the sisters’ three-pronged attack like it was a slightly bothersome fly as you got the impression she could have won this match without Hana’s help, in her sleep and with one arm tied behind her back. In that sense, it worked. With Goya going straight into the title picture Stardom need to establish her quickly and winning handicap matches is a decent way of doing that. We’re building to Tora vs Iwatani for the WOH Title as we got a nice snippet between the two here. They seemed to have decent chemistry while Tora brought the fire with a barrage of elbows. Although, I have to say, it got me just as hyped for an Iwatani vs Kyona match as it did that because, well, Jungle’s fantastic and looks great against everyone. Elsewhere, Starlight Kid impressed as she got me for a second when she hit the 180 Frog Splash on Tora. Unsurprisingly, they didn’t choose to beat the challenger in the build-up to the match, and Natsuko eventually rallied to pin Kid instead. This was a solid showing, without ever going past that. If you’re looking for developments in the story, it won’t do much for you, but it kept them ticking along nicely ahead of the title showdown. I’m a huge fan of the idea behind the Future of Stardom Title. It gives the rookies in the company something to compete for as they don’t necessarily have to win matches to get a shot at it. Although, Utami’s meteoric rise does make her seem somewhat untouchable compared to the likes of Iida. Not that Iida didn’t pull up her sleeves and give it a go. The one opening she got she dived into, throwing herself across the ring with an onslaught of dropkicks before getting the significantly taller Utami up for a slam. That lass is all fighting spirit and watching her battle from underneath was a load of fun as the crowd bought into her mettle, popping big for every rope break and two-count. Of course, it was not to be. Utami might have had a few scares, but you always knew that when she wanted to win this, she would. A hard slam followed by a vicious looking Torture Rack was all it took, and Iida had no choice but to tap. Still, this was easily Saya Iida’s best performance, and she continues to prove that she has something to give. The lass only debuted a couple of months ago, and she’s already putting on decent quality matches. You’ve got to give her credit for that. Utami seems to agree as she promised her that once she gets her first singles victory, she can have another shot at the champ. Oedo Tai were doing some horrendous corpsing during Natsu’s robotic pre-match promo. Miyagi was making sure to look at the ground in an attempt to hide her laughter. In a twist on the formula, it was QQ who charged across the ring to get us started. They were out for revenge after the numerous times Oedo Tai has done the same to them and quickly introduced their opponents to some parts of the arena they might not have explored earlier in the day. Thankfully, it was kept to a minimum, and it wasn’t long before we returned to the ring. Once we got there, Kagetsu strapped on her working boots. She entered the ring early on and stayed around for a while, taking on AZM, Priestley and Konami. All three sequences were great and worked in a slightly different style as she went from the pace of AZM to the striking of Bea and finished up with the submissions of Konami. 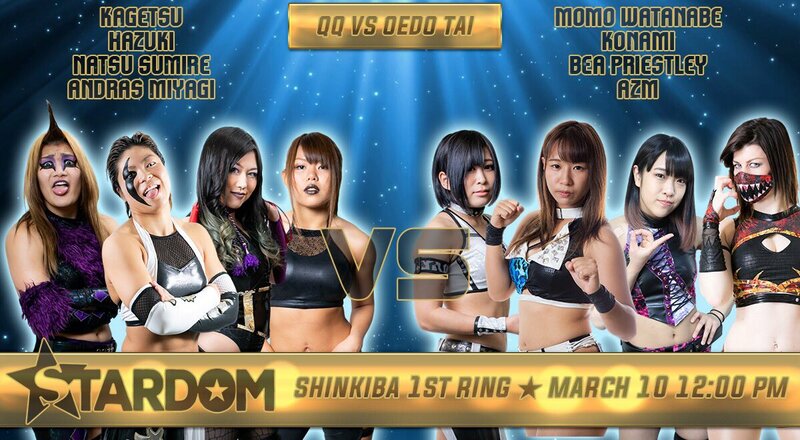 Outside of that, this was your standard Oedo Tai multi-women main event, which is a compliment. I know comparing them to LIJ is slightly lazy, but like LIJ they work a lot of these matches, and they almost always deliver. It doesn’t matter how many times we’ve seen this match; it was still going to be enjoyable. The finish saw Yamaguchi get involved, delivering a Lariat to AZM and setting Natsu up to take it home. Afterwards, Sumire was feeling woozy and collapsed, only getting to her feet after her teammates got the fans chanting Olympus (she’s decided that’s her new nickname, I can’t remember if I mentioned that or not). She then cut a promo (which was rambling even by her standards) about the Goddesses of Stardom title match. That turned out not to be the weirdest promo on the show as Yamaguchi then announced she was leaving Stardom at the end of the month to travel the world and find the best shortcake cafe. I’m glad to say that the Japanese fans seemed as bemused about that as me. She is retiring, though and according to Kagetsu is leaving Japan for a bit. Whether the shortcake bit is true or not is anyone’s guess. A fun show that got better as it went along, I always enjoy some Oedo Tai nonsense while Iida delivered the best performance of her young career so far. Throw in some enjoyable undercard bouts, and you won’t regret spending your time with this.